Due to recent developments with our (still current) mayor of Toronto, Mr. Rob Ford, and the now undeniable evidence due to his recent confession that he used Crack Cocaine, I decided to write a blog on this topic. As to your personal conviction and opinion on the matter I will leave it to you to decide what is right and wrong and I will not try to express my personal opinion. However, I want to explain what crack cocaine is and what dangers are entailed with its use as a recreational drug. Crack cocaine is always derived from cocaine so I separated this entry into two blogs. This blog will cover cocaine. To begin, the drug cocaine is derived from the coca plant Erythroxylon coca, which is a plant native to the hills of Columbia, Peru and Bolivia. The plant itself has been used in these regions for thousands of years (proven by mummy remains that still had coca leaves in their mouths upon their discovery) by the local people as an appetite depressant and as a substance that increases vitality and energy. The primary way that these indigenous people used the plant was by chewing the fresh leaves or by steeping loose leaf into tea. These routes of administration release only minute amounts of the active ingredient (cocaine) in the coca plant over an extended period of time (not all at once!). This is much different from the high concentrated levels of cocaine found in the powder form or in crack cocaine found on our streets and distributed illicitly. Furthermore, the cocaine absorbed from these sources is absorbed in a very short period of time. These two qualities make powdered cocaine as well as crack highly addictive substances that produce strong euphoria like effects almost immediately after administration. On the other hand chewing leaves produces a very weak stimulatory effect over a prolonged time. This quality makes chewing leaves a substantially less addictive and less dangerous activity. 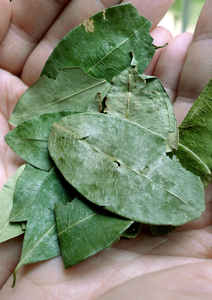 This is why the Bolivian and the Peruvian government recently allowed local farmers to harvest a controlled amount of coca leaves for consumption by the local people for traditional purposes. The powdered cocaine from which crack is derived is a totally different story. Powdered cocaine is extracted from an enormous amount of leaves and concentrated more then a hundred fold. The most common route of administration is snorting the powder. It quickly reaches the brain after absorption through the nasal mucosa (i.e. the inner lining of the nasal cavity), where it increases the level of the neurotransmitters dopamine, serotonin and epinephrine between nerve cells. The increased level of these neurotransmitters is what produces the effects of cocaine. They include a feeling of euphoria, a surge of energy, decreased hunger and sleepiness, self reassurance and confidence, increased libido, and increased overall vitality. The effects are short lasting, lasting only up to an hour. This is the quality that makes it so addictive. The person using the drug simply wants to keep their state of heightened consciousness for a longer time. Furthermore, by keeping the level of the mentioned neurotransmitters at a substantially higher level between nerve cells (in the synaptic cleft to be more precise) the number of receptors for these neurotransmitters diminishes. This makes the person consume more of the drug to reach the same effect. What’s even more troubling is that when the person stops using the drug there are less receptors for dopamine and serotonin to bind to. This has the same consequence as having a diminished level of these neurotransmitters, which causes the feeling of depression, and sometimes even suicidal thoughts. To bring the level of receptors to their natural level may take even up to a month. Thus a feeling of depression, excessive sleepiness, lethargy, and increased appetite and weight gain make for a troubling situation for anyone that is addicted to cocaine and decides to quit! It is also the reason why people are quickly hooked on it and want to continue its use, to prevent these unpleasant feelings. In the words of Isaac Newton, what goes up must come down. The other complication of cocaine use is that contrary to amphetamine-like substances cocaine blocks certain sodium channels. This causes it to have a numbing effect commonly felt on the face region after snorting the substance. However, it also blocks these receptors in the heart, which may lead to sudden cardiac death. Other possible complications include sweating, rapid heart rate, palpitations, heart arrhythmias, breakdown of the nasal septum, kidney and liver damage, heart attacks (due to its quality of constricting blood vessels), brain strokes, and a quite impressive list of autoimmune diseases such as Lupus Erythromatosus, Goodpasture’s Disease, Stevens-Johnson Syndrome, and Glomerulonephritis, to name a few. In tomorrow’s blog I will talk about how crack cocaine is connected with powdered cocaine and what the major differences are between the two. I will also discuss some very interesting historical aspects of cocaine, like its use in a very popular wine that was commonly consumed by important historical figures like Queen Victoria of England and even two popes! In the mean time, it’s needless to say to stay clear of this drug. Just because the mayor of Toronto does it in his “drunken stupors” doesn’t mean you should! Categories: Lifestyle | Tags: insomnia, sleep | Permalink.